In amongst the family visits, last minute shopping and social gatherings, I love to cosy down with a good book over the Christmas holidays in my never-ending quest for inspiration. This year I have really embraced the kitchen after discovering that I actually do like baking (see the Brit Decor Food & Drink section for the evidence!) so I guess it is inevitable that two of my top seven book buys should be food related. There is, of course, a selection of interior related books too as one of my favourite simple things is to quietly flick through the large page images of a hardback and plan my next project whilst munching on one or two of my favourite chocs. Following the huge success of her first book, Pattern, Orla Kiely's Home no.1 invites us to peek inside the designer's own house as well as a series of British, Irish and Scandinavian examples photographed by Richard Powers. We also discover some of the mid-century designs which have inspired this iconic designer's work. The distinctive sleeve pattern design makes this a definite coffee table book! I do love a good collector's edition don't you? That's exactly what you get with no.2, J R R Tolkien's The Hobbitt, which is the prelude to Lord of the Rings. This hardback edition includes brand new reproductions of all the drawings and all of the maps by Tolkien. The massively popular The Kinfolk Table no.3 from the creators of Kinfolk magazine reflects on the growing trend in the 'simple things' in life with a charming look at understated, unfussy entertaining. This cookbook profiles recipes for simple breakfasts, one-pot dinners or even a perfectly composed sandwich! 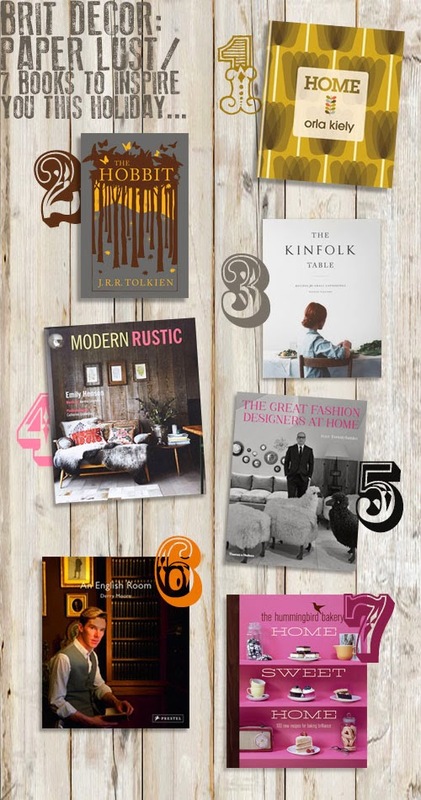 Book No.4 Modern Rustic is a recent purchase of mine after I was lured inside by the gorgeous mid-twentiety century sofa on the cover image. This is a gem of a reference book for earthy colour palettes and rich textures. Emily Henson and Joanna Simmons take us through the various 'looks' including, Modern Rustic, Sophisticated Rustic, Bohemian Rustic, Quirky Rustic and Vintage Rustic. This next book, The Great Fashion Designers at Home no.5 is a fascinating look at the homes of some of our most legendary designers such as Chanel's apartment at 31 Rue Cambon - another must-have coffee table book! An English Room no.6 immediately sounds so quintessentially British doesn't it! This book is founded upon the adage that an English person's home is their castle, whether it is an actual castle, a modest studio or a middle-terrace, the home is sacred. Again, I love to peek at other people's interiors and in this book we get to see the likes of Benedict Cumberbatch (of Sherlock fame) divulge where he likes to read scripts and the mastermind that is Stephen Fry invites us into his dressing room at the Apollo Theatre in London! Finally, no.7 The Hummingbird Bakery's Home Sweet Home takes an indulgent look at over 100 new recipes which celebrate the art of home-baking including, custard cream cupcakes, pineapple upside-down cake, blueberry buns and even chocolate cake with vanilla meringue (my mouth is actually watering right now! ).